One New Aftermarket Replacement Final Drive Bull Gear made to fit John Deere Dozer models: 420, 430 (Below Serial Number 125000), AM2135T, M211T, M2364T. Our processing system is automated. Thank you for your continued patronage. We carry parts for Engines, Transmissions, Front & Rear Axles, Hitch & Drawbars, Undercarriages, Final Drives, Seats, Bearings, Cups, Cones, Seals, Discs, Couplers, Gears, Brakes, Pressure Plates, Pilot & Throw Out Bearings, Ring & Pinions, Gaskets, Decals and MORE for most high wear items. We also carry replacement parts for the Boom Cylinder (Seal Kits, Tubes, Glands, Pistons, Rods). 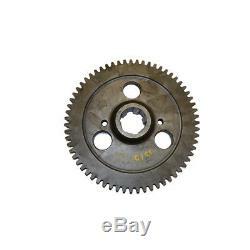 The item "AT15155 New Final Drive Bull Gear for John Deere Dozer 420 430 AM2135T M211T +" is in sale since Wednesday, January 20, 2016. 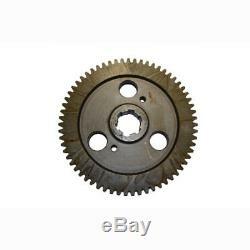 This item is in the category "Business & Industrial\Heavy Equipment Parts & Accs\Construction Equip Parts".